Florida Family History Tour Starts in 6 Days! Pirates, Presidents, Conquistadors & More. Join me and Col. John Eidsmoe as we explore the ancient sites of northeastern Florida. We will tell the stories on location of the Fort at St. Augustine and the French Huguenot colony at Jacksonville, Ft. Caroline. We will remember the courageous Reformed settlers who brought the Gospel to the natives of the region and their subsequent extermination by the Spanish for the capital crime of rejecting the Catholic Church and following the Calvinist Reformation. We will examine the lives and times of fearless conquistadors, notorious pirates, superstitious explorers seeking the fountain of youth, the ferocious no-holds-barred Scots-Irish General Andrew Jackson who seized Florida and would not give it back, and the natives who suffered through all the invasions and fought a war with the United States that was never concluded! Our tour culminates at one of the most interesting Sesquicentennial Civil War reenactments of 2014 at the scene of the largest battle fought in Florida, the Battle of Olustee. Space is limited so register today for a weekend to remember on this Landmarks in History tour! On 8 January, 1815 the Battle of New Orleans was fought between England and the United States at Chalmette Plantation, the last battle of the War of 1812. We are in the third year of the bicentennial of that war; the battle fought in Louisiana has become the best-known one of that sanguinary conflict. That day in history is fraught with interesting and significant providential meaning and circumstance that most people are not aware of. The American commander was a Scots-Irish Tennessee lawyer, named Andrew Jackson. He was known for his quick temper and frontier sense of honor. He carried inside his body irremovable bullets received in duels. One pundit claimed he rattled like marbles in a tin can when he walked. The governor of his state commissioned him Major General and he led an army of riflemen, both whites and Indians, to fight the Red Stick Creeks in the Creek Civil War, being fought in the midst of the larger War of 1812. While at Fort Strother in northern Alabama, nearly his entire army deserted for lack of food and pay and he remained to “fight the Creeks by myself if I have to.” Another force was raised to assist him and he defeated the Red Sticks at the Battle of Horseshoe Bend on the Tallapoosa River. Responding to a call to protect New Orleans from a British expeditionary force, he took his small army to the Crescent City to take on the veteran red coat army sailing there to drive the Americans out. Besides Jackson’s surviving duels, mutinies, and political enemies to engage the British in New Orleans, the fact that the city and the Louisiana Territory itself belonged to the United States is providence worthy of note, and at the center of the story is one of the greatest of men in European history, Napoleon Bonaparte. In 1801, with the Americans expanding westward, the French Empire of Napoleon sensed a real threat to their Louisiana Territory. At the same time, a slave revolt on the French island of Saint-Domingue was destroying the economy and peace of that Caribbean outpost. Settling the hash of opponents in the manner to which he was accustomed, the Emperor dispatched an army of 31,000 veterans. After the defeat of the armies of the slave revolt, the French troops would continue to New Orleans and secure Louisiana. However, 25,000 French soldiers died of yellow fever in Haiti, including more than 20 generals. The survivors straggled back to Europe and Napoleon sold the Louisiana Territory to the United States for three cents per acre. The British army landed and attacked Jackson’s barricaded troops. The British were hurled back, losing many officers, including the commanding General, the Honorable Sir Edward Pakenham, brother in law to the Duke of Wellington, and more than 2,000 men, to the marksmanship of the American frontiersmen and allied pirates, Indians, and dockside riff raff. General Jackson wrote to a friend that “It appears that the unerring hand of Providence shielded my men from the shower of balls, bombs and rockets.” There were a little over 300 casualties on the American side in the campaign. The British forces retired to their ships and planned the next step. Mobile, Alabama was there for the taking but word was received that Napoleon (once again, unknowingly and providentially, changing history to the benefit of the United States) had escaped from exile on the Island of Elba and all British troops were recalled to eventually fight at Waterloo. General Jackson himself wrote President Madison after the battle that “Heaven, to be sure, has interposed most wonderfully on our behalf.” Andrew Jackson’s name became a national by-word for determination, courage, and military prowess, eventually vaulting him into the Presidency of the United States. A year does not pass before I am asked what books, other than the Bible, most influenced me in my early years. Another interesting question I also am called upon to answer, especially at this time of year — what was my favorite Christmas present? My family always celebrated Christmas and it was certainly a highlight of the year for me and my siblings. The answer to both questions above happily intersected on December 25th, 1962. It was on that day, after I had recently turned ten years old, I received under the tree The American Heritage Picture History of the Civil War. The Centennial commemoration of the War Between the States was in its second year. I, as a ten year old, had gotten a “whiff of the powder” in second grade when a classmate showed me some postcards he had gotten from his grandmother who lived near Gettysburg. My first exposure to the existence of the war had come a year earlier when my grandfather showed me a daguerreotype image of one of my ancestors in his uniform, taken in 1864. I read a few age-appropriate books on the Civil War for a couple years, played army, wore kepis, and began collecting toy soldiers; I also tried to persuade my friends to wear gray instead of blue (still do). But after getting the American Heritage book for Christmas, I was hooked for the rest of my life on the study of history, especially Civil War history. I have not sought a cure. The book fell under the editorship of Richard Ketchum who is best known for writing good books on the War for Independence — Saratoga, Yorktown, Bunker Hill, Trenton and Princeton — writing till he died in 2012 at the age of eighty nine. The actual narrative text of the American Heritage book came from the pen of Bruce Catton, who became the best-selling author of Civil War books of the 1950s and 60s. Of course now I know about his effusive Northern biases with which I occasionally take issue, but his writing style, as a professional journalist, at times took my breath away and seized my imagination. The real clinchers for me, however, were the illustrations and maps. I scoured every page till I could identify every image, many of which have reappeared over the years in other media contexts. The original photos, political cartoons, broadsides, and paintings suffused the text with a sense of the reality of the past. The colorful maps of the battles, from a bird’s eye perspective, brought about my Christmas, 1963 collection of toy soldiers (ever after known as “the Civil War Set”), arranged in similar formation on the bedroom floor. Two years ago I had the privilege of visiting Pearl Harbor, Hawaii on the 70th Anniversary of the battle. I visited the USS Arizona Memorial where more than 1,000 American sailors died in the Japanese surprise attack. I visited the Punch Bowl Cemetery, the final resting place of more than 53,000 American servicemen. I strode around the Battleship USS Missouri anchored at Ford Island—the ship upon which the Japanese formally surrendered to General Douglas MacArthur and Admiral Chester Nimitz to end World War II. Finally, I attended the formal memorial service for the men who died on that day in which the future of the world seemed to hang in the balance. During that memorable visit I interviewed or assisted in interviewing about twenty five survivors from that “day that will live in infamy.” Each one had a different story and role to play, however small, in that history-changing event. The experiences of each man were seared into their memory and each one knew one, sometimes many, men who lost their lives in the attack. The oldest sailor I met was the last surviving officer of the Arizona, then ninety-six years old. His son had brought him there one last time to visit the scene of the most dramatic part of his life. He was dressed in uniform and told amazing stories of survival and sacrifice in minute detail. He also was suffering from Alzheimer’s and would not remember any of us an hour after the interview. One of my favorite interviews was with a sailor aboard the Battleship USS California, with a crew that was renowned for its athletic prowess in defeating other ships in sports competitions. The man who told me his story said he had gotten up early on that Sunday morning and dressed in his football uniform for a game scheduled with another battleship team. When the call to battle rang out, all sailors, no matter their stage of dress or undress, had to race to their duty stations. His was in the crows nest. There he sat throughout the battle in his football gear, at eye level with the Japanese torpedo bombers, whose pilots waved at him as they dropped their tin fish to destroy American vessels. The California settled into the mud of Pearl Harbor only to be resurrected, reconstructed and sent to battle again more than two years later. Another sailor was responsible for raising the signal flags on his ship by climbing the ropes in full view of the attacking planes. He told me that a Japanese plane flew directly at him firing; in the micro-second he had left wondered if he should face his attacker or be shot in the back. In the event, the machine gun bullets bracketed his position and he survived the battle. Perhaps the most striking and surprising information that came from those interviews had nothing to do with the courage and perseverance of the men, nor their remarkable memories, nor their longevity having come through the ardors of combat in the World War. What impressed me most, was most distressing for me, was their uniform denial that God had anything to do with their survival (some of them almost miraculous) or their lives, in any way. They almost uniformly denied providence and embraced luck and chance as the only explanation for their being alive today. Some of them still used profane language. Only a few attended church services. I realized that these ninety-something-year-old veterans were as spiritually lost as the day they were born. We can never take for granted that men—and women for that matter—who have lived long lives, perhaps done great deeds, and come close to death, have ever humbled themselves before God’s almighty sovereignty over their lives and sought His divine Mercy and Grace. He has provided many years to repent and believe in Christ; yet they have remained spiritually dead, attributing their survival to good luck, false gods, or their own fiercely independent sovereign will. Now is the day of repentance; having survived withering fire of Pearl Harbor, or any other near miss, our days are still only as long as the withering grass. Few Presidents of the United States have been so thoroughly self-conscious about applying the Constitution to their calling as Chief Executive, than “Honest Grover.” In the perennial list of great or near great Presidents issued by academic historians, Cleveland usually ranks below the middle. One of the reasons for that seems to be that he did not try to expand the power of the Federal Government, create new runaway bureaucracies, micromanage the economy, take bribes for favors, or sign off on vote-buying government giveaways. 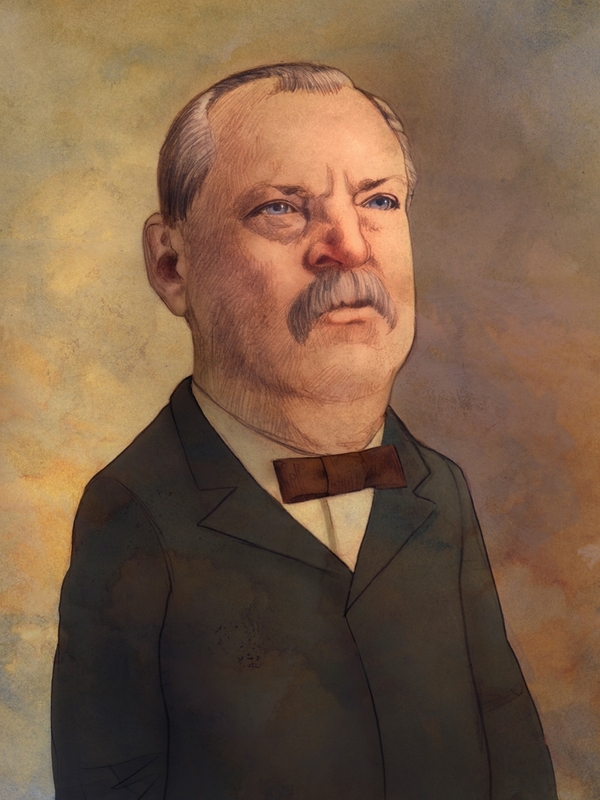 Grover Cleveland is the subject of several excellent biographies especially Allen Nevins’ Grover Cleveland: A Study in Courage in 1932, but he remains unknown to most Americans today. Thus, the need to rediscover the 22nd and 24th President of the United States, a need requited in this new political biography. Raised in a devout Christian family, Stephen Grover learned his Bible and his catechisms, knowledge that would be helpful to him throughout his life. His first elected office was as Sheriff of Buffalo, New York, traditionally considered a den of political corruption and bribery. It also presented daunting challenges that a young lawyer would likely find distasteful. The law said the sheriff was responsible for the execution of malefactors convicted of capitol crimes, and Grover carried out his duty literally. His honesty and diligence led to the governor’s chair, prompted by fellow Democrats and reformist Republicans looking to dismantle corruption in high places, regardless of party. Cleveland, however, was swimming against the tide of Progressivism that was engulfing his party and, though he won his second term in office, a severe economic downturn hit, resulting in his party abandoning sound money and turning to a new leader in William Jennings Bryan. The Republicans won the next four elections. No longer in office, Cleveland retired to live out his life in the quiet and intellectually stimulating environment of Princeton, New Jersey, where he is buried in a modest grave which simply has his name and dates carved on it. He was a modest, honest, forthright, and courageous Conservative man and President, whose example could well bear repeating in our own day. The Battle of Gettysburg is in my DNA. About the age of eight my best friend brought to school a handful of postcards which his parents had bought him on a visit to his grandparents. The images were of men dressed in blue and gray uniforms and carrying muzzle-loading rifles at Gettysburg, Pennsylvania. Little did I realize that my instant attraction to those Civil War Centennial reenactors, however inauthentic (“farbs”) their impressions were, had set me on the course that my life would follow. As my interest in history grew, Gettysburg always loomed in the background—the subject of hundreds of books, many of which I read, the place we went on family vacations, the streets where my great grandfather had been captured on the first day of the battle, the location of the overwhelming Pennsylvania Monument where another grandfather and several uncle’s names were inscribed. It is a place where I camped as a reenactor on the 125th anniversary and where I was in the line of battle behind General Garnett in the movie Gettysburg. Men from all the states came in their serried ranks—from Minnesota to Florida, from Maine to Texas—more than 150,000 bent on killing one another in a fury of combat lasting three long and bloody days. At stake was nothing less than the South seeking to “dissolve the political bonds and . . .initiate a new government” and the North willing to die in the hundreds of thousands to prevent that independence. The cost in this battle eventually reached about 46,000 casualties, leaving hundreds of widows across both nations and countless thousands of grieving kinsmen and friends. It is no wonder the battlefield today is a place of remembrance and memorial stones where the descendants and others come to pay homage to the men who sacrificed for their two countries and to study the detailed minutiae of the grand military display that Providence brought to pass on three July days one hundred fifty years ago. For every Southern boy 14 years old, not once, but whenever he wants it, there is the instant when its still not yet two o’clock on that July afternoon in 1863, the brigades are in position behind the rail fence, the guns are laid and ready in the wood and the furled flags are already loosened to break out and Pickett himself with his long oiled ringlets and his hat in one hand probably and his sword in the other looking up the hill waiting for Longstreet to give the word and it’s all in the balance, it hasn’t happened yet, it hasn’t even begun yet, it not only hasn’t begun yet but there is still time for it not to begin against that position and those circumstances which made more men than Garnett and Kemper and Armisted and Wilcox look grave yet its going to begin, we all know that, we have come too far with too much at stake and that moment doesn’t need even a 14 year old boy to think “this time, maybe this time,” with all this much to lose and all this much to gain: Pennsylvania, Maryland, the world, the golden dome of Washington itself to crown with desperate and unbelievable victory the desperate gamble, the cast made two years ago. . .
Not all national treasures have slick brochures, National Park Service employees, or state of the art interactive electronic entertainments. While there is nothing wrong with those appurtenances, occasionally a private collection of unique and significant value springs up, or in this case, evolves, into something that is so educational, so entertaining, so unbelievably valuable to understanding a part of our history, that leaving the beaten path to see and experience it seems a tiny price to pay for the value. We recently had the privalege to visit just such a place: the Civil War Aresenal of owner and creator Duffy Neubauer, in Starkville, Mississippi. His private collection includes a Civil War artillery battery, and the rolling stock that moved the guns, supplied the troops, and made it necessary for hundreds of thousands of horses and mules to be fed, watered, and disposed of during the War Between the States. The real treasure of the museum is Duffy himself whose passion for the War and especially the use of artillery, exceeds anything in my previous fifty or so years of studying the Civil War. He is not just a reenactor extraorindaire, but a polymath on all things artillery. His talks and teaching engage the student constantly as his no nonsense but friendly presentations shock and amaze even the most experienced Civil War buff. There is no admission fee, but you must call ahead for a tour. He has several different presentations, including one just on bugle calls or another just on the types of shells, cannon balls, or to other related ordinance. On your next visit to Mississippi, stop by Starkville, visit the Ulysses S. Grant Presidential Library, the Mississiippi State University campus, and the Starkville Civil War Arsenal for the tour of a lifetime with Duffy Neubauer. His contact information is 662-323-2606. You won’t need earphones, cell phones, or ipads. It is okay to wear a blue or gray uniform, but be prepared to be dragooned into a cannon crew and be taught more pertinent and interesting Civil War information than you thought possible.